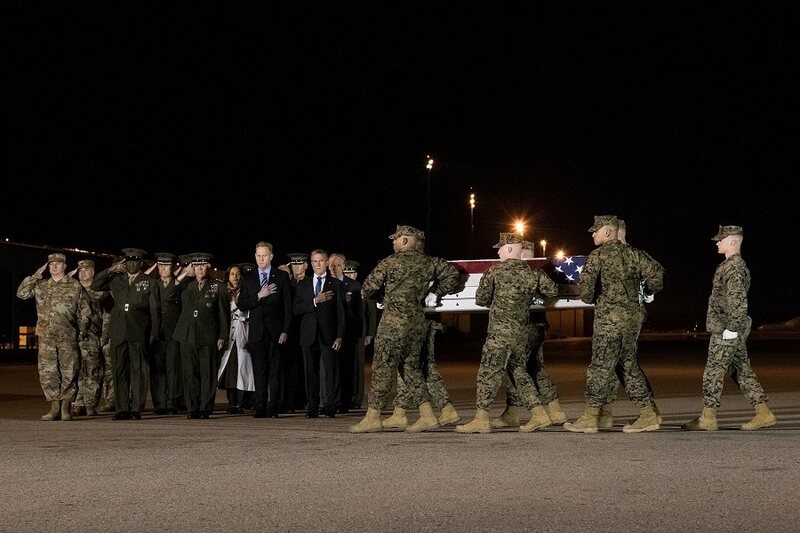 A U.S. Marine Corps carry team transfers the remains of Staff Sgt. Christopher A. Slutman during a dignified transfer ceremony on the evening of April 11, 2019, at Dover Air Force Base in Delaware. The deaths of three U.S. Marines this week in Afghanistan should serve as a wake-up call to every single American. As families of the fallen mourn and three warriors wounded in Monday’s car bomb attack recover in military hospitals, it is our solemn duty to pray – and pay attention. First and foremost, let’s learn more about these three American heroes and the extraordinary lives they led. Staff Sgt. Slutman was a husband and a father to three daughters. In addition to being a U.S. Marine, he was also a firefighter in The Bronx. “Firefighter Slutman bravely wore two uniforms and committed his life to public service both as a New York City firefighter and as a member of the United States Marine Corps,” New York Fire Commissioner Daniel Nigro said in a statement, as quoted by WABC-TV. All of us at The Stream are praying for this valiant Marine and firefighter’s wife, three daughters, relatives, friends and fellow Marines. Corporal Hendriks was 18 years younger than Staff Sgt. Slutman, but showed the same kind of bravery by enlisting the Marine Corps straight out of high school in Long Island, also according to WABC. “Sons” is plural because Robert’s brother, Joseph, is also a Marine. He is currently bringing his brother’s flag-draped casket back home to the United States, according to the report. I happen to know a Marine who has escorted a fallen family member home from Afghanistan. At this unimaginably painful hour, please say a special prayer for Joseph Hendriks, as well as their mother, father and all family members and friends. As fellow Americans, their grief is ours. Sergeant Hines was on his third overseas deployment when he made the ultimate sacrifice, according to The York Daily Record. “He was earnestly a true American patriot,” Kevin Poff, who once worked with Hines at a Texas Roadhouse, told the newspaper. The fallen Marine’s hometown paper reports that Hines played football at Dallastown Area High School before joining the Marine Corps in 2006. “Ben was a leader,” said school district Superintendent Ron Dyer, as quoted by PennLive. Please say a prayer for the entire Hines family, as well as this departed warrior’s friends and fellow Marines. We will never forget. Did most Americans pause to acknowledge the sacrifices of these three American patriots and their wounded brothers in arms after Monday’s suicide bombing, for which the Taliban has claimed responsibility? Sadly, the answer is no. For more than a decade, I have been calling on politicians, journalists and citizens to take notice of the ongoing burdens being shouldered by our brave men and women in uniform and military families. The results have been mixed, at best. In fact, I doubt a majority of Americans are even aware that U.S. troops are still in harm’s way in Afghanistan, Iraq, Syria and other war zones. The fact that thousands of volunteer warriors keep enlisting, serving and deploying despite being mostly ignored by those they’re risking everything to protect is why our military community is the very best of America. For those of us who recognize and appreciate their daily deeds, all we can do is continue saying “thank you” and – most importantly – sharing their stories. Staff Sgt. Christopher Slutman, Cpl. Robert Hendriks, Sgt. Benjamin Hines and their injured fellow Marines were a blessing to each and every one of us. They left our country with the greatest possible gift: they laid down their lives for those who couldn’t defend themselves. While praying for America’s newest Gold Star families, we should also thank God that these brave men lived.